I know, I know – stop the presses, right? (Or, more accurately, stop the CMSes.) But have you ever really stopped to consider the imagery that the word “content” brings to mind? What do you see? Lots of individual items flying around all over the place, no? We as content marketers interpret content to mean unique projects perhaps based on URLs or headlines, but definitely packaged as individual entities. We even like to say “pieces” of content. So, why does this matter? Why spend two paragraphs articulating this seemingly mundane, obvious detail? Because, even though we think of content that way, audiences don’t. Nope. Readers’ assessment of whether our content is great is an entirely subjective call, perhaps accompanied by a short list of obvious foundational principles for what “quality” means. So, a great experience to our audiences is based on defining content not as all those swirling pieces but as the consumption itself. If your marketing gets put on hold after you actually win the click and your audience spends time with your content, then how helpful, entertaining, or good is it really? We like to debate the semantics of distribution and measurement, both of which are crucial. But audiences honestly and genuinely want us to excel in both our creativity and our ability to teach or entertain, neither of which has to do with our abilities to gain more clicks from Google searches. In the end, the true measure of great content is the same as the true measure of great people: It’s what’s on the inside that counts. We need to zoom in to start thinking more about the actual content we create. Not the headlines, not the SEO, not the channels – the paragraphs, the pages, the pixels, the “stuff.” As much as we want to debate quality versus quantity, those are simply not mutually exclusive characteristics. As proof, look at the thousands in the working world who always must produce both, whether they’re journalists, agency creatives, or yes, even some content marketers. So, rather than get stuck at the kids’ table when the adults from more “pure” creative functions start showing up, I for one want to improve my creative skills. And if you do too, I’d encourage you to start with one subtle but powerful element of content production: segments. Segments are small sections of content that are uniquely and clearly packaged then repeated throughout a single project or across multiple works. Segments manifest in many ways across various content. Templates are segments that have been wire-framed for easy future use. Series are longer segments that can stand alone and run repeatedly on a regular schedule. Call-outs are small but loud segments meant to summarize something or guide the eye to something critical. 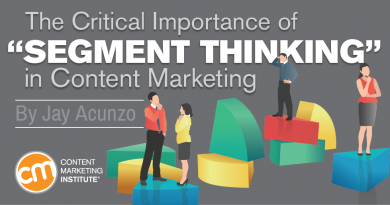 Segments also provide several benefits to both the reader and the company behind the content. They’re great for retaining attention since they’re easily identifiable and often repeatable, thus becoming anchor points to follow along within a larger piece or series of content. To a degree, the regularity of some segments can build brand affinity and a sense of community. You’re in on the “joke” of that segment, like all the audience members at The Colbert Report who positively roared whenever he introduced each Tip of the Hat, Wag of the Finger segment. I started thinking about the notion of segments when I transitioned from sports journalism into content marketing. I’d secured a role as a digital media strategist at Google, which exposed me to the ways of marketers and advertisers. That was in 2008, but few things have changed: Segments are obvious and commonly deployed in media but underused by marketers. 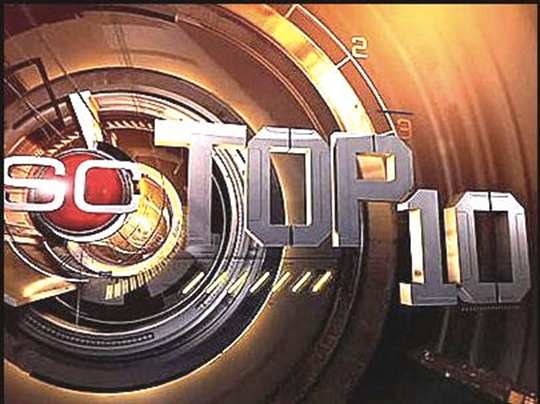 I was so used to the SportsCenter model that it seemed like a no-brainer to incorporate that style into my work. But I’ve learned that thinking isn’t the case across the board. So, how can we start applying segments in our work? Let’s start by looking at a medium where segments are truly critical parts to its effectiveness as a whole but are still underutilized – podcasting. Podcasts should be shining examples of segment thinking, but again, they often fall flat. That’s the podcasting best-practice outline. But since the goal is to create media worthy of an audience’s time and/or subscription, then a best practice actually means “doing the same damn thing as everyone else.” That’s a lousy way to build an audience. Think of it this way: Listening to a podcast is a linear experience. In other words, it’s much harder to skip around or skim and thus requires the listener to consume the content start to finish. To minimize drop-off and get people from the start of an episode to the end, great podcasts often introduce various segments to maintain energy and retain your attention. And because podcasts are naturally serialized, with most shows launching episodes on a regular schedule, these segments are able to become regular, highly anticipated features of the show, which both retains AND grows the audience. Beyond podcasting, segments can be applied to nearly any medium. Anyway, Zach is the NBA columnist for Grantland, ESPN’s spinoff site run by its most popular writer, Bill Simmons. 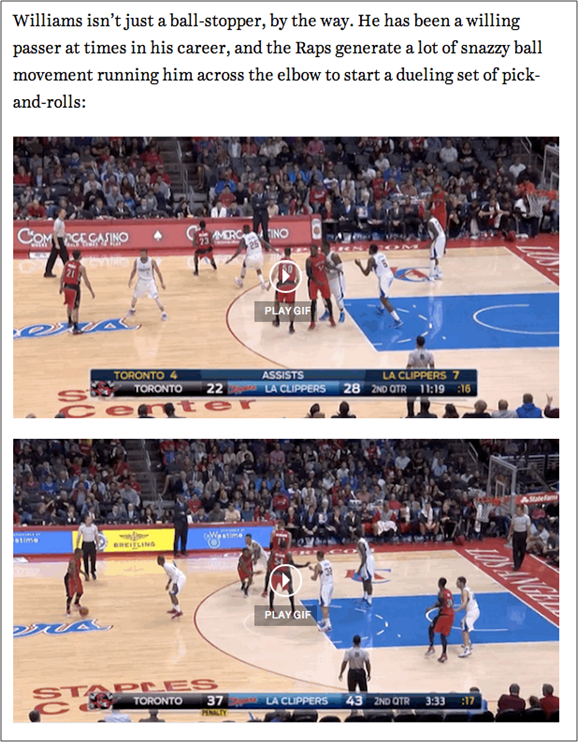 Examples of Zach’s great usage of segments include his recurring “10 Things I Like and Don’t Like” conclusion in many of his columns (example here, near the end) and his player-analysis columns that illustrate his points via animated GIFs. Here’s an article where Zach uses GIFs. You’ll notice that after he introduces each player with a few paragraphs of copy, he embeds one or two GIFs to illustrate the point he’s making about a given player’s skills. Help Scout, makers of customer support software in my home city of Boston, is one of the under-the-radar masters of content marketing. Its lead content creator and strategist is Gregory Ciotti who clearly understands the importance of segment thinking. One great example is 10 Ways to Convert More Customers Using Psychology. As with most of its guides, this is a non-gated piece packaged as a beautiful, single-scroll page. Also like most of the guides, it’s pretty long (though worth the read). However, Gregory and team do a great job inserting small call-out boxes titled “Bottom Line” to summarize each section. Thus, you can read the entire thing and receive a few bigger lessons sitting like neatly wrapped gifts at the end of each chapter. Or, you can simply scroll through the guide, appreciate its beauty, and stop only for these main takeaways. As I mentioned briefly, segments come in all shapes and sizes. Sometimes they’re within single works, but sometimes, when they’re much larger or add enough value by themselves, they can become series. 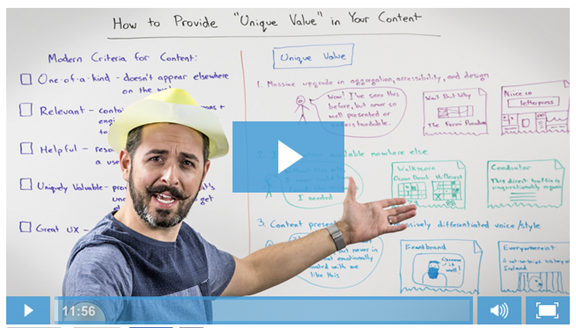 It might be a familiar example, but it has to be mentioned: Moz’s Whiteboard Fridays, under the always steady, brilliantly bearded Rand Fishkin, has long been the best example of a series produced for content marketing purposes. In two simple words, the name sets your expectation: There will be a whiteboard and it’ll be on Fridays. The bulk of Wistia’s content marketing is done through videos that are clever, educational, and above all, heartwarmingly human. Each features at least one member, usually more, of the Wistia team, which has turned its employees into something akin to mini celebrities or characters to its audience. Because of this, and because Wistia cares deeply about company culture, it is able to use Non Sequitur Fridays to offer regular windows into the lives and interests of various team members. 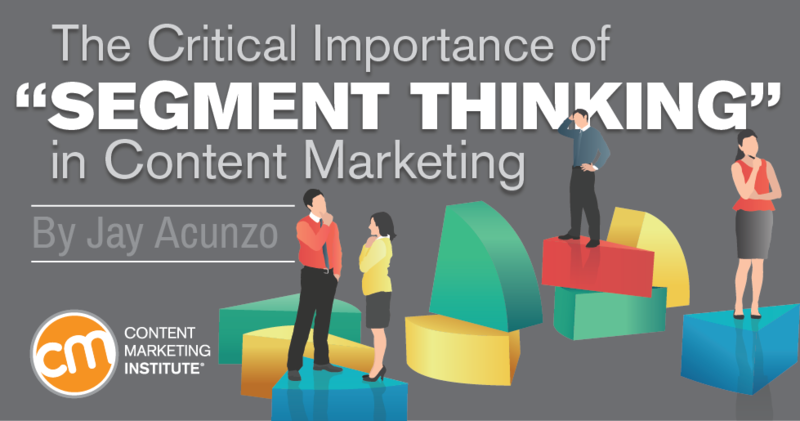 Great content marketers think that way. Great audiences also consume that way. And isn’t it wonderful when those things align? So, starting now but continuing far into forever, really and seriously think about the stuff you create, and examine it on a deeper level than just the wrapper. We need to stop trying to force dud missiles to fly and instead become better engineers. And if something fails, we should stop slathering more paint on the frame and start examining the actual circuitry. We are all content marketers. And it’s time to dedicate just as much thought to that first word as we do the second. Want to craft well-done segments in your content marketing or add them to your planning efforts? Check out the 2014 CMW sessions available through our Video on Demand portal and make plans today to attend 2015 CMW. So, this one time, a marketing blog called Jay Acunzo a “marketing antihero,” prompting him to immediately buy a Batman mask. Unfortunately, his wife won’t let him wear it in public. Luckily, when Jay isn’t traveling the world delivering keynote speeches, he’s building wildly entertaining podcasts for B2B clients as the founder of Unthinkable Media … and he’s probably wearing his Batman mask the whole time. (Don’t tell anyone, k?) Oh, Jay also advised brands on their digital strategy while working for Google, led the content team at HubSpot, and served as vice president of the VC firm NextView. He’s appeared in the New York Times, the Washington Post, Fast Company, Forbes, and more. Salesforce once called him a “creative savant,” but as far as he can tell, there’s no good mask for that. Say hi to his unmasked face on Twitter or Instagram, or listen to the refreshing stories about driven makers and marketers on Jay’s podcast, Unthinkable.